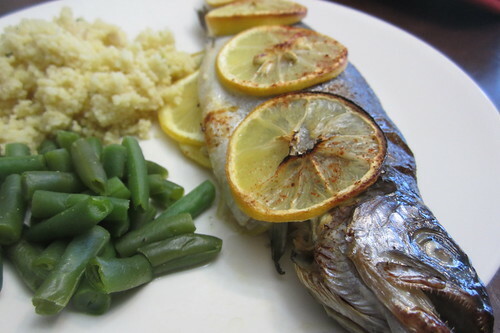 Rainbow trout are tasty and very easy to prepare. All you have to do is gut them and they are ready to go! Trout need to be prepared differently if they are fresh verses store bought. Fresh, as in less than a few hours dead, trout have a much, much better flavor. You really do not need to do much to them. This recipe is for fresh caught trout. It is too mild for store bought fish, they will turn out bland. 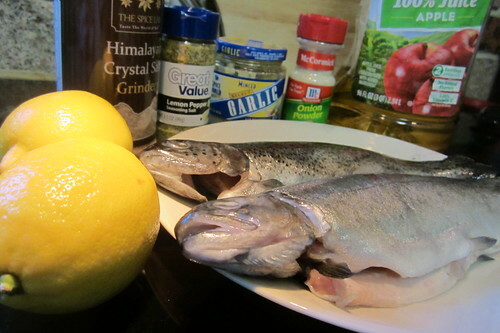 You will need two freshly caught trout, two lemons, lemon pepper, minced garlic, onion powder, salt, pepper, paprika, and white wine. You can substitute apple juice for white wine, but it will not be nearly as good. Sprinkle the cavity of the fish with lemon pepper, garlic, onion powder, salt, and pepper. Don't be afraid to lay it on thick. Stuff the cavity with thinly sliced lemons. 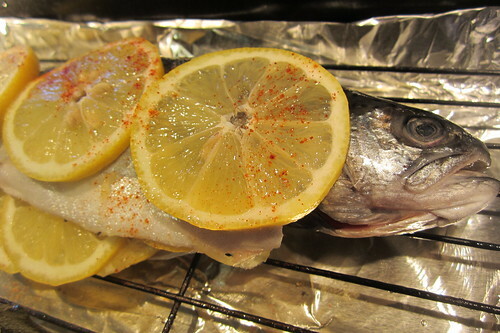 Put the stuffed fish on a greased rack over a foil lined pan. Pour about 1/8 of an inch of wine into the pan. 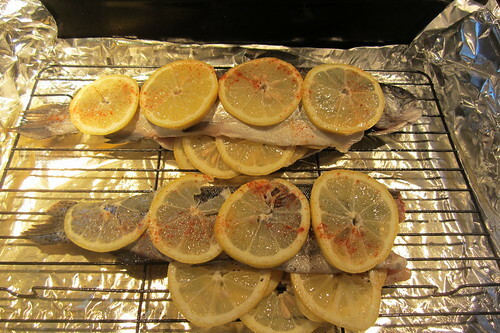 Place thinly sliced lemons on top of the fish and sprinkle with paprika. If you really like paprika, sprinkle it on heavily. Bake at 350 for about 20 minutes. Check the fish often as cooking times will vary depending on the size of the fish. It is done when the flesh flakes off the bone. Keep in mind, underdone fish tastes better than overdone. I like to eat it with the head on. My wife, however, always makes me cut off the head on hers. First Annual June Four-Fish Fiesta!